SereneSound Digital - The Sound of Serenity in the MRI Imagine an MRI procedure with Mozart instead of gradient noise! SereneSound Digital audio system delivers pure, all-digital sound to patients during MRI scanning. They can listen to music and audio books. Bring in a favorite CD or plug in an MP3 player and turn MRI into a personalized scanning experience. Communicating with technologists and other staff during the procedures enhances patient comfort and confidence, often enabling completion of even the most complicated interventional procedures. State-of-the-art passive noise-attenuation headset and a full range of premium features make this the choice for MRI-compatible audio. SereneSound Digital comes standard with a CD/DVD changer, AM/FM receiver, intercom and high-fidelity ceramic headset. Treat your patients to the ultimate audio entertainment with SereneSound Digital and revolutionize the MRI and fMRI experience. Make the most of your budget now with audio and upgrade to video when you are ready. 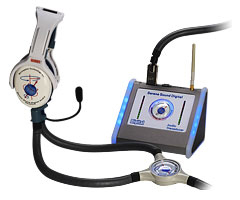 Bi-directional patient intercom with active noise-cancellation microphone. 30 db headset gradient noise attenuation. 500Hz – 10KHz frequency response. Dual volume control adjustable by both patient and technologist. Intercom fades out music and enables microphone. High-fidelity speakers for both patient and MRI suite. Zero-Artifact LaserLink transmission technology between console and MRI suite.